Everyone wants instantaneous always-on availability when it comes to chat. Skype included. That’s why the latest update to Skype on Android comes with a lesser drain on your mobile’s battery. Skype promises “aggressive battery savings” that will allow you to leave Skype running in the background. Download Skype 4.7 from the Google Play Store and test it out. The update will be also come to the Kindle Fire family of tablets later this month. Skype said that better battery management has been made possible partially by sacrificing instant group chat notifications. It has been switched off as a default. 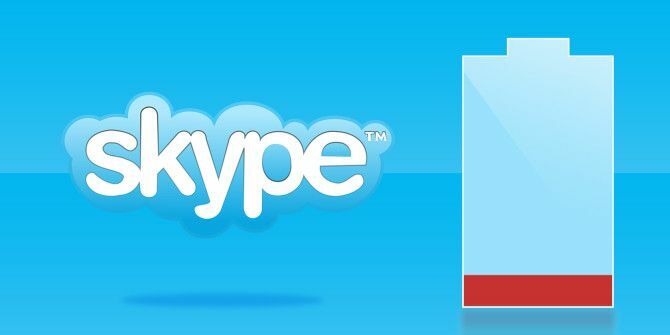 The bugbear of power versus calling experience remains a work in progress and Skype says that it will bring back the notifications later when it is no longer impacts the battery so much. Then, users will again be able to receive group messages instantly. If group chat is critical for you, keep the feature by going to Settings > Notifications > and check the Sync group messages in the background box. Fix for audio and video calling on tablets that do not have Bluetooth. Workaround for the KitKat bug which caused a runaway process when the camera was synced in the background. Now lists your Windows Live Messenger contacts in the Skype (default) view, not just the All contacts view. Skype promised a better instant chat experience last year. Has it taken that first step? Try out the Skype chat client on your Android and let us know about any battery savings you could measure. Explore more about: Chat Client, Instant Messaging, Skype, VoIP. I am currently updating latest version of Skype on my android Smartphone. And yes downloading complete, I love the new interface. Well earlier I was facing the battery consumption problem let’s see if there is some improvement in latest version as most of the time whenever I am on video call I have to keep my phone on wireless charger which I recently purchased from Amazon http://www.amazon.com/dp/B00J2TEL28 for my Nexus 5. Do drop in again and tell us if it works as promised.